Hello & Happy June Paper Made Bakery Fans! I love the cardstock in the Paper Made Bakery kits...look at that fab texture! I ran a panel through the cameo to get the heart panel. I made a quick banner sentiment and called it done! Just a fun wedding card to have on hand. This kit has been one of my favs...I love sentiment stamps and I'm a huge fan of any Amy Tangerine collection! The kit is still available HERE. Stay tuned for our June blog hop scheduled for Monday! I love love love love your latest Amy!!! LOVING all the hearts!!! And loveeeeeeeeee what you have created with this month's kit!!! All of the cards you created with this set were amazing and I too am loving that sentiment stamp set. These are awesome Amy!!! Super creative with this kit!!! love how you used the wood grain paper. The heart background is AWESOME! Fantastic! Love the raining of hearts! Very cool card with the sentiment. 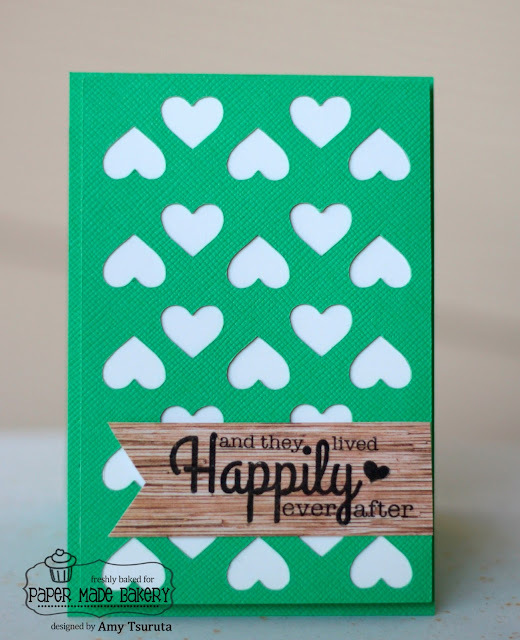 Amy love all your card from this kit, the newest run through your Cameo is so fantastic with the random hearts. You totally rocked that kit!! wohoo! Great card! I love the die cut background. You made amazing cards this month, that woven one is still my favorite! Love them all! The heart cut background is too cute. OhHHH! I love that first card-- esp. the hearts and that green paper with the woodgrain! LOVE!! Awesome kit and wonderful showcase! I may have to break down and get this one! Amazing work Amy!! Always love your fun cards!! first card full of hearts... and I heart it wholeheartedly!!!! Fantastic card for today Amy! Simply fantastic! These are fabulous, love the hearts! You have showcased this set so fabulously, Amy!! I am loving the colors and design!